Is the 'Harvey and Lee' Theory Credible? You are here: Home › Further Reading › JFK Assassination FAQs › Is the ‘Harvey and Lee’ Theory Credible? One of the most bizarre JFK assassination theories: supported by next to no objective evidence, and notable for having been debunked, by the exhumation of Oswald's body, two decades before the book was even published. 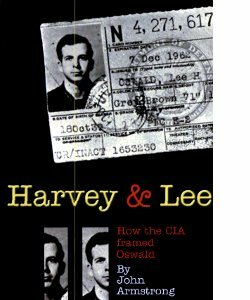 A book by John Armstrong, Harvey and Lee , published in 2003, put forward the notion that the person known as Lee Harvey Oswald was in fact not one but two people: ‘Harvey’, who spoke Russian, and ‘Lee’, who didn’t. In 1966, an academic philosopher, Richard Popkin, published The Second Oswald , in which he noted the many reported sightings of Oswald in two places at the same time and suggested that Oswald was being impersonated. Michael Eddowes’s The Oswald File , published in 1977, put forward an altogether more outlandish theory, claiming that the Oswald who returned to the US from the Soviet Union in 1962 was an impostor who went on to shoot President Kennedy on behalf of the Soviet regime. It was as a result of pressure from Eddowes that Oswald’s body was exhumed in 1981. Unsurprisingly, the body in the grave turned out to be that of the actual, American–born Oswald who had defected in 1959. In 1985, W.R. Morris and Robert Cutler published Alias Oswald , in which they adapted Eddowes’s theory by suggesting that Oswald had been replaced not by the Soviets in 1962 but by the US authorities in 1958. Armstrong took the preposterous ‘replacement Oswald’ idea to a new level of improbability. In his view, the identities of two 12–year–old boys, ‘Harvey’ and ‘Lee’, were combined by the CIA as part of a dastardly plan, in the hope that when the boys grew up they would turn out to look sufficiently alike to fool their families but not so much alike as to fool an eagle–eyed amateur investigator. It was ‘Harvey’ who defected to the Soviet Union and took a job at the Texas School Book Depository, only to be shot dead by Jack Ruby. 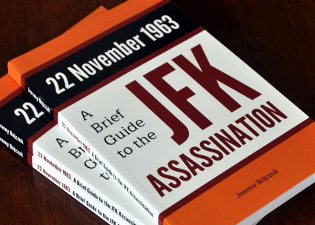 ‘Lee’ helped to set up ‘Harvey’ to take the blame for the assassination of President Kennedy, and, according to Armstrong, “was, and may still be, very much alive” ( Harvey and Lee , unnumbered page immediately preceding page 1; as well as unnumbered pages, the book is full of typographical oddities, with italics, bold–face and underlining seemingly applied at random). Contradictions in official documentation, such as Oswald’s school records, which suggest that he attended two schools in different parts of the country at the same time. Eye–witness evidence, including descriptions of Oswald and reported sightings of him in different locations at the same times. Subjective judgements of Oswald’s appearance in photographs. People sometimes make mistakes when filling in forms and writing down information such as dates, and others make mistakes when reading this information. For example, Oswald was supposedly present in North Dakota at a time when ample evidence shows that he was in New Orleans; it turned out that a handwritten ‘N.O.’ (for New Orleans) was mistakenly read as ‘N.D.’ (for North Dakota). The problem with Oswald’s school records relied on a mistaken reading of the number of days when he attended each school. Eyewitnesses are unreliable, as is human memory in general. After any newsworthy event, there are many reported sightings of the people at the centre of the event. Almost all of these sightings are mistaken; even though most of the witnesses are honest, they are almost always mistaken. Just because photographs of Oswald taken at different times and in different poses and lighting conditions kind of sort of look a bit different if you half–close your eyes while tilting your head to one side, it doesn’t follow that they must be of different people. The photographs of Oswald, which Armstrong allocated to ‘Harvey’ and ‘Lee’, were analysed by experts on behalf of the House Select Committee on Assassinations, who concluded that the photographs depicted one man, not two; see Volume 6 of the appendix to the HSCA Report . John Armstrong performed a useful service to researchers by digging out a large amount of documentary evidence, which is now stored at Baylor University in Waco, Texas, and is available at the university’s website: http://www.baylor.edu/lib/poage/jfk/index.php?id=72484. A good deal of this evidence found its way into Harvey and Lee , which is nearly 1000 pages long. Unfortunately, the quantity of the evidence does not improve the credibility of the interpretation Armstrong places on it. If all of the evidence is easily consistent with a straightforward, non–conspiratorial explanation, it really doesn’t matter how much of that evidence there is. The rational conclusion will be the same: Lee Harvey Oswald was one person, not two. and he assumes that other items of evidence must be reliable if they are consistent with his proven fact. Armstrong makes no effort to question the reliability of his witness. He merely states that “I was convinced that … [McBride was] honest, sincere, and accurate.” On the basis of a single, uncorroborated piece of evidence, Armstrong claims on page 6 that he now “had photographs of two middle–aged woman [sic] who both claimed to be ‘Marguerite Oswald’, the mother of Lee Harvey Oswald” (italics in the original). This “probability” quickly turned into a certainty, again with no further evidence cited to support it. We meet Marguerite Oswald next on page 13. After a brief account of Marguerite’s early life, Armstrong jumps straight in and refers on page 14 to “the ‘Marguerite Oswald’ imposter who testified before the Warren Commission” and “Edward Pic, who had married the real Marguerite Oswald” (italics in the original). The matter is settled! On the basis of essentially no evidence at all, Marguerite Oswald has been magically transformed into two people. Having proved to his satisfaction that someone had impersonated Marguerite Oswald, Armstrong immediately goes on to refer to “the short, dumpy, heavy–set ‘Marguerite Oswald’ imposter”, using the same form of words three times on page 14 and many more times later in the book, as though repetition would give the idea the support it otherwise lacks. From page 14 onwards, the impersonation of Marguerite Oswald is presented as a proven fact. The highly improbable notion that Oswald’s mother had been impersonated for several years, which is central to Armstrong’s ‘two Oswalds’ theory, was generated from just about the flimsiest type of evidence possible: one person’s memory of a woman he had met only once, several decades earlier. It is remarkable just how little evidence it took for Armstrong to convince himself of the existence of two Marguerite Oswalds. As early as page 14, it will be obvious to even a half–alert reader that the ‘Harvey and Lee’ theory is the product not of solid evidence and argument but of wishful thinking. All but the most credulous conspiracy theorists, who surely make up Harvey and Lee ’s target audience, would be wondering how many more evidence–free inventions were lurking in the remaining 900–odd pages. For another illustration of the weakness of Armstrong’s construction, let’s look at how he concludes that one of the two boys, whom he names ‘Harvey’, was a Hungarian who spoke Russian. On pages 66 and 67 of Harvey and Lee , we learn that an unnamed woman made an unsolicited phone call to a woman who had featured in a news report because she was distantly related to the murdered police officer, J.D. Tippit. The unnamed woman claimed that “She knew Oswald’s father and uncle who were Hungarians and Communists” (underlining in the original) and that both men had lived in New York. Is the Unnamed Woman Credible? Armstrong admits that the woman’s story “was tenuous and unverified … [and] that she could not have been referring to Oswald’s father, Robert Edward Lee Oswald, who died on August 19, 1939”, two months before his famous son was born. Armstrong goes on to speculate that “If this woman’s information and knowledge about Oswald’s father and uncle was accurate, or even partially accurate, then there was a distinct possibility that she could have known the father and uncle of the smaller, thinner, almost frail–looking ‘Oswald’” ( Harvey and Lee , p.67; underlining in the original). In other words, if she had known Oswald’s father and uncle, it was possible that she had known Oswald’s father and uncle. Armstrong gives us speculation and tautology but fails to corroborate the unnamed woman’s two claims: that she knew Oswald’s father and uncle, and that they were Hungarian. Until the woman’s identity is revealed so that her acquaintance with Oswald’s father and uncle can be examined, and in the absence of any credible evidence that Oswald had Hungarian relatives, the only rational conclusion is that the woman’s claims are worthless. Did ‘Harvey’ Learn Russian in Hungary? Next, Armstrong builds on this speculation by claiming that “if Oswald’s father and uncle were Hungarians, it is likely that young Oswald’s native language was Hungarian and/or Russian” (p.67), and that this would explain Oswald’s proficiency in Russian by the time of his apparent defection to the Soviet Union in 1959. Russian is in fact one of the least likely languages that a Hungarian would have learned natively. If ‘Harvey’ had spent his first few years in Hungary with his Hungarian family, his native language would almost certainly have been Hungarian. Unless his family was Russian, there is almost no chance that he would have learned Russian as his native language. Hungary’s borders, like those of most countries on the European mainland, do not always align themselves with linguistic groupings. If ‘Harvey’ had been brought up in Hungary close to the border, he may have picked up the language of one of the communities on the border: German, Slovakian, Ukrainian, Romanian, Serbo–Croat, or Slovenian. There was no Russian–speaking community on the borders of Hungary. By the age of 12, Armstrong’s ‘Harvey’ was attending a school in New York, where he presumably spoke English. The need to have learned English suggests that he would have emigrated to the US several years earlier, which in turn suggests that he cannot have spent many years in Hungarian schools. Although Russian was taught in schools in Hungary at the time, ‘Harvey’ would not have had the opportunity to acquire more than a rudimentary knowledge of the language. This will be obvious to anyone who has sat through several years of foreign language tuition at school and emerged at the other end barely able to string a basic sentence together. The most common second languages taught in American and British schools are probably French and Spanish, both of which are closely related to English. Russian and Hungarian, on the other hand, do not just employ different alphabets. They belong to different language families: their grammars are completely different, and, apart from a tiny number of modern borrowings, their vocabularies are completely different. A Hungarian boy emigrating to the US at a young age is very unlikely to have arrived with more than a smattering of Russian, if he had learned any Russian at all. The profound differences between Hungarian and Russian make nonsense of Armstrong’s claim that if “young Oswald’s native language was Hungarian” it would have helped him to acquire proficiency in Russian. English possesses more similarities to Russian than does Hungarian. Learning Russian would have been less difficult for the historical, American, Lee Harvey Oswald than for the imaginary Hungarian ‘Harvey’. The reason for the CIA’s plan to merge the identities of two boys, according to Armstrong, is to do with a secret programme in which US agents went into the Soviet Union, falsely claiming to be genuine defectors. Oswald’s career shows that he was very likely to have been a participant in such a scheme, whether it was organised by the CIA or another agency. One of the requirements for infiltrating an agent into a foreign country is that he/she have an intimate knowledge of the local language. … And there is little point in sending an American agent, taught in the United States to speak a Slavic or Oriental language, to infiltrate these countries because they would speak with an accent. One way to avoid the problems of physical appearance and accent is to recruit local residents or former residents living abroad. The whole purpose of the ‘Harvey and Lee’ plan was to produce an American who spoke Russian like a native. Unless the defecting agent could be mistaken for a native Russian, there was no point in spending several years bringing up two unrelated boys in the remote hope that they would turn out to look alike. Unfortunately for the ‘Harvey and Lee’ theory, the Oswald who defected to the Soviet Union in 1959 spoke Russian exactly as would be expected of an American who had learned the language in the US. He was competent enough to be able to carry on lengthy conversations, but he made grammatical mistakes and spoke with a noticeable accent. According to Ruth Paine, “His Russian was poor. His vocabulary was large, his grammar never was good.” ( Warren Commission Hearings , vol.3, p.130.) George de Mohrenschildt had a higher opinion of Oswald’s Russian, but pointed out that he spoke with an accent ( I Am a Patsy! , Chapter 2). Oswald was not and could not have been mistaken by the Soviet authorities for a native Russian speaker. During parts of his stay in the Soviet Union, Oswald even pretended to the authorities that his Russian was worse than it really was ( Warren Report , p.692). Although “there is little point in sending an American agent, taught in the United States to speak a Slavic or Oriental language, to infiltrate these countries because they would speak with an accent,” that is precisely what happened in the case of Oswald. And, of course, the Oswald who defected never claimed to be anything other than a disaffected former Marine, born and bred in the USA. The basic premise of the ‘Harvey and Lee’ theory is just as flimsy as the speculation that pads out the theory. As it happens, John Armstrong’s ‘Harvey and Lee’ theory had been conclusively refuted two decades before Harvey and Lee was published, by an item of medical evidence: a bone defect close to Oswald’s left ear, the product of a mastoidectomy operation when he was six years old. According to Armstrong’s description of his two characters’ lives, the mastoidectomy operation was carried out on ‘Lee’ ( Harvey and Lee , p.23), and the man killed by Jack Ruby and buried in Rose Hill Park Cemetery, Fort Worth, was ‘Harvey’. Armstrong supported his interpretation by noting that no mention is made of a mastoidectomy scar in the autopsy report of the man buried in the grave. There is, of course, a perfectly plausible explanation for the absence of a scar: in the period of almost 18 years between the operation and the murder, the scar had healed and become invisible. The question was settled in 1981, when the exhumation of Oswald’s body found evidence of “a mastoidectomy defect”. For details, see L.E. Norton, J.A. Coffone, I.M. Sopher, and V.J.M. DiMaio, ‘The Exhu­mation and Identification of Lee Harvey Oswald,’ Journal of Forensic Sciences , vol.29 no.1 (January 1984), pp.19–38, available online at http://mcadams.posc.mu.edu/parnell/norton1.htm. The defect was described as follows: “The mastoid prominence of the left temporal bone revealed an irregularly ovoid 1.0 by 0.5 cm defect pene­trating to the interior of the mastoid bone with the defect edges rounded and smooth” (http://mcadams.posc.mu.edu/parnell/norton2.htm). “The left mastoidec­tomy defect also correlated with the antemortem medical records” (http://mcadams.posc.mu.edu/parnell/norton4.htm). In other words, the man in the grave had indeed undergone a mastoidectomy operation. The scar from the operation must have healed. ‘Harvey’ was in the grave but had not undergone the mastoidectomy operation. ‘Lee’ was not in the grave but had undergone the operation. Solid physical evidence proves that the theory is nonsense, and that the two characters, ‘Harvey’ and ‘Lee’, were nothing but figments of Armstrong’s imagination. There was just one person: Lee Harvey Oswald, who underwent a mastoidectomy in February 1946 and was buried at Rose Hill in November 1963. Armstrong’s meticulous research must have made him aware of the Journal of Forensic Sciences article, which had been published 19 years before Harvey and Lee appeared. Armstrong dealt with the exhumation on pages 147, 946 and 947 of his book, in which he admitted that, as the article states, the body was identified as that of Lee Harvey Oswald on the grounds that its teeth matched Oswald’s dental records, although he speculated that DNA tests might overcome this evidence and give support to his theory. Despite the long–standing existence of definitive proof to the contrary, Armstrong insisted on page 947 that (italics and bold–face in the original) “The remains examined by Dr. Norton were of Harvey Oswald”, the fictional character who had not undergone a mastoidectomy operation. The undeniable evidence of a mastoidectomy on the body in question is simply not mentioned. http://spot.acorn.net/jfkplace/09/fp.back_issues/25th_Issue/facts.html, in which Armstrong summarises his ideas. http://harveyandlee.net/ is a fuller account by one of Armstrong’s followers. http://reopenkennedycase.forumotion.net/f13-the-harvey-lee-evidence picks holes in many aspects of the theory. W. Tracy Parnell, ‘Harvey and Lee: The Handwriting is on the Wall,’ Kennedy Assassination Chronicles , vol.7, no.1 (Spring 2001), pp.12–18, examines the handwriting of ‘Harvey’ and ‘Lee’, and concludes that they are of one person. At http://wtracyparnell.blogspot.com/, Parnell analyses specific problems with Armstrong’s evidence. http://mcadams.posc.mu.edu/parnell/h&lmain.htm contains more articles by Parnell, including one which explains the North Dakota mix–up. http://educationforum.ipbhost.com/index.php?/topic/19762-harvey-and-lee-john-armstrong/ contains some lively debate between sceptics and true believers. http://mcadams.posc.mu.edu/2oswalds.htm gives a good summary of the weaknesses in Armstrong’s theory. The conclusion to the article illustrates the harm done by far–fetched and poorly argued theories, which allow supporters of the lone–assassin hypothesis to conflate rational criticism with the likes of the ‘Harvey and Lee’ theory: “The whole rickety structure is built on unreliable witness testimony, carefully selected and inaccurate documents, and a mountain of implausible supposition. Which makes it a fitting metaphor for JFK assassination conspiracy theories generally.” Whenever you read that anyone who doubts the lone–assassin hypothesis believes that the moon landings were faked by the Bilderberg Group and a race of giant lizards, part of the blame lies with speculative nonsense like the ‘Harvey and Lee’ theory.